Upon review of my previous post listing the interests I have had over the years, there was one glaring omission. There are simply some things that are so entwined as to be obvious beyond enumeration. I am, and have been a ham radio operator since 1983. KA9RVK, first licensed as Novice class. Oh, the sultry Illinois nights spend rattling out Morse Code, chatting with folks all over North America. Earned my Tech Plus certificate in 1985 and used my radio equipment to be a storm spotter. Passed my General exam in 1999 (I believe) and received the call KC7RAD. Most of my equipment was sold in the mid 2000's to cover various expenses relating to... changes. BUT, if all goes well, I shall be back on the air again soon. And, here is my stable. On the left is "Athena", my Harley Sportster XL1200C. 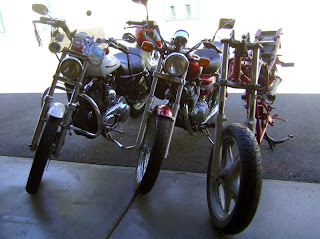 In the center is "Reb", my Honda Rebel. On the right is "Vixen", my Suzuki VX800 project bike. Recently "Vixen" has been the object of my attention. Not long ago she transitioned from 'tear down' status to 'rebuild' status. I hit a wall; a wall so solid I was ready fold. It was the engine. 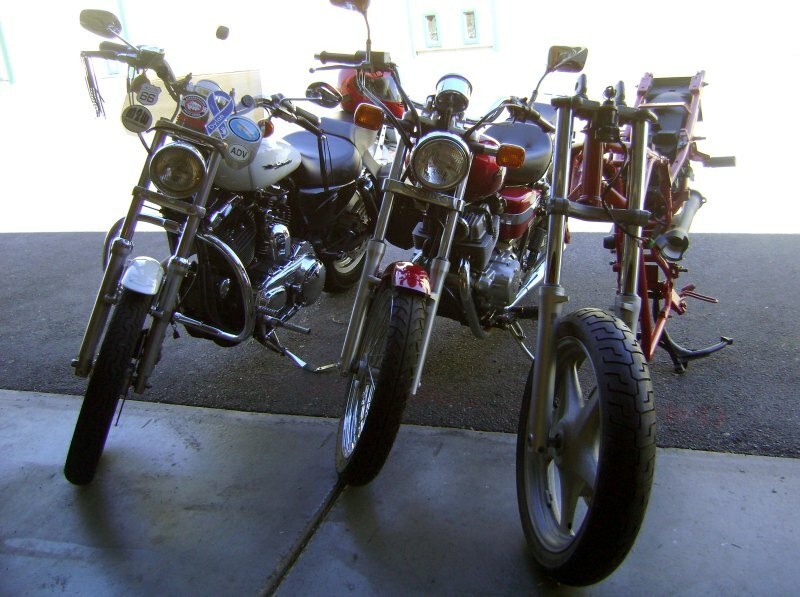 Honestly, there are two VX800s in my garage; one rebuild and one donor. The rebuild bike's engine has issues; the cylinders need to be bored out to remove rust damage. It was my hope that the donor bike's engine would be in better condition. Better, yes, but not by much. Rust in the cylinders, bad pistons, rusty primary crank gear, carbs that required complete rebuilds. It was not a pretty picture. Then it hit me, where are the bolts? There are these parts that require major rework and I have no idea where the bolts are. What am I doing? 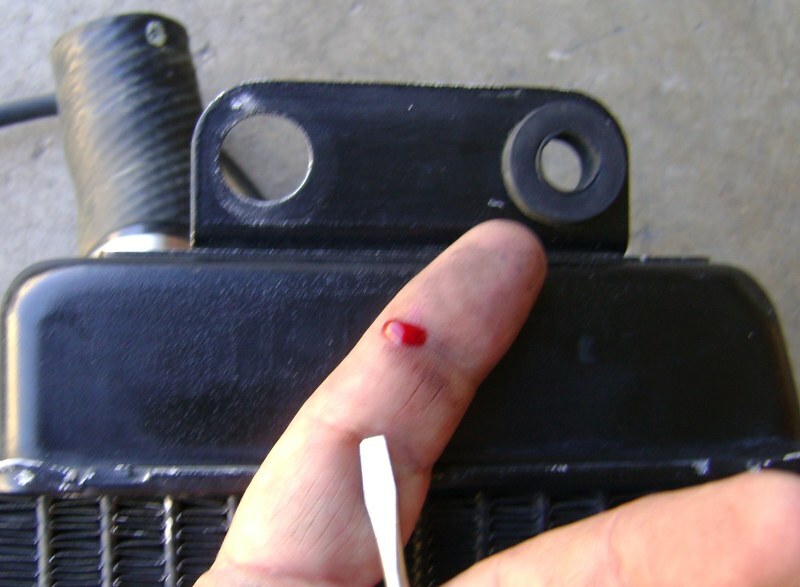 I am not a motorcycle repair professional, let alone one with skill to perform a bottom-up restoration! Parts with out bolts, without something to hold then into a functional piece of motorcycling beauty is nothing! Parts of a life with nothing holding them together; is that nothing as well? 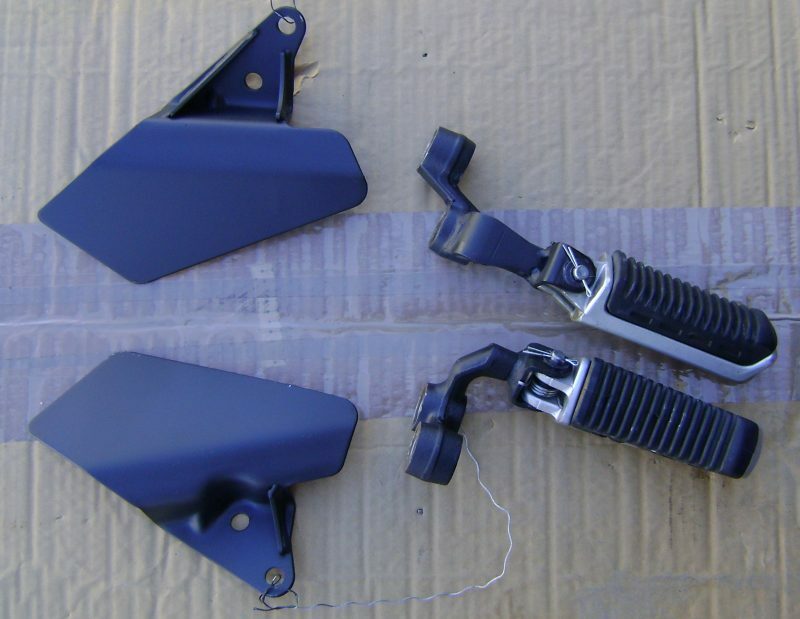 After posting my frustration to the VX800 e-mail list, a fellow building a custom VX800, and author of the VX800 Restoration Project sent several great e-mails. They were the kick in the seat inspiration that was needed. It isn't about building a perfect bike. It isn't about having deadlines or hard goals each week or month. It isn't about worrying whether the bolts are all there. It is about the rebuild and about enjoying the time spent doing what few do to an uncommon motorcycle. It is to be enjoyed. The pieces will fit together eventually. The bolts will be located. This is an act of enjoyment not toil. Perhaps less time and concern should be wasted worrying about the connecting pieces of a life and more spent on enjoying the act of connecting. Finite things, regardless of their connectivity should be enjoyed. Enjoy and be mindful that the screw driver may be sharper than you think. we really need to be like ants, dont we?! one step at a time, one grain of sand at a time, one realization after another, one accomplishment, then another. focus on what brings bliss razor. the rest will fall into place. Couldn't agree with you more, mq. One step at a time, one grain of sand at a time; ants can build fantastic structures this way. Recently, it seems, 'bliss' is as fleeting and fickle as a hummingbird, buzzing and flitting here and there with little intention. Great post Razor. I like how you can relate bike restoration with life lessons. That was always true of model building as well, model building teaches patience, ingenuity, thinking, problem solving, just now you have a larger model. Have fun with it. Get a big gallon can of Carburetor cleaner, Barsol, (The size you can soak parts in ) and WD-40. Soak down those cylinders with the WD-40 and after soaking wipe cylinders, repeat until the rag comes out rust free. If it's not pitted you might get away with just a good honing. 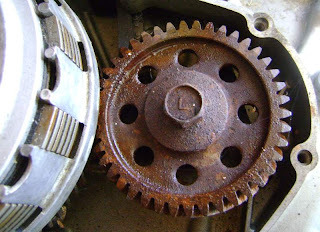 Soak the gears and internal parts in the Barsol and most that rust will come off.